Note: Those who are pregnant or moms of infant children should always seek the advice from their doctors and take into consideration any special circumstances that may exist. Shooting is a perishable skill, so 9 months to 3 years is a long time to go without pressing the trigger. If you don’t practice, you can lose your proficiency. 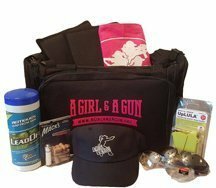 Fortunately you don’t have to avoid shooting, but you do have to pay close attention at how to shoot safely during pregnancy and beyond, as well as other options to keep your skill sets strong. Lead enters your body in two ways: ingestion, such as touching your food with your hands containing gun powder residue; or inhalation if you are shooting at a range with poor ventilation, as opposed to facilities with state-of-the-art systems to remove contaminants from the shooting area. Even small amounts of lead can cause serious health problems. Young children are especially vulnerable to lead poisoning, which can severely affect mental and physical development. High levels of lead may cause vomiting, staggering walk, muscle weakness, seizures, or coma. At very high levels, lead poisoning can be fatal. In most ammo brands, the primer inside the bullet contains lead that is released into the air every time you shoot your gun. The lead gets on your hands, arms, face, and in your hair, and also lingers in the air and you inhale it. In addition, the projectile of the round is usually made out of lead, which increases your exposure. Xavier, a Registered Nurse, admits that: A pregnant mother does transfers lead to her unborn child; however, doctors do not know what are safe levels of lead for a baby. Exposure to lead has proven to cause decreased birth weight in babies, affect the baby’s head circumference, cause miscarriage, premature delivery, and preeclampisa. Noise not only damages your hearing, but has greater adverse effects. Just like lead exposure, noise exposure can cause decreased birth weight, premature delivery, and developmental problems. In addition, increased noise levels can cause stress, resulting in high blood pressure and anxiety. Some pregnant women have had to leave a shooting range because their babies kicked and moved so much because of the noise. Xavier says: Your baby will start responding to sound as early as 16 weeks into pregnancy, and at 24 weeks the baby’s cochlea is completely developed. Studies have shown that continuous loud noise may be harmful to a baby. In women that were exposed to a continuous loud noise at 80dB daily for 8 hours (a normal work shift) babies were born with hearing loss, decreased birth weight, and even suffered a risk of early birth. A gunshot is 140dB. Repeated exposure for long periods can damage a baby’s hearing; however, if you may feel that your baby can tolerate a little range time. Some doctors advise to avoid shooting during the third trimester of your pregnancy. If you want to be extra cautious, shoot .22 Long Rifle or use a suppressor. Can I shoot during my pregnancy? This is a wonderful question that we love to get! There is not a simple yes or no answer, but we have several resources that will help you make the best decision for you while pregnant and/or breastfeeding. A similar question is: can I exercise while pregnant? The professional answer on that is if you already are physically active, continue your normal workouts as usual. If you are not someone who exercises regularly, pregnancy is not the time to start training for a marathon. The same can be said for shooting sports, but all things should be kept in moderation. The easy answer is yes you can. The complicated answer is: there are rules that you MUST follow to stay safe. No use of indoor ranges while pregnant. Period. No exceptions. 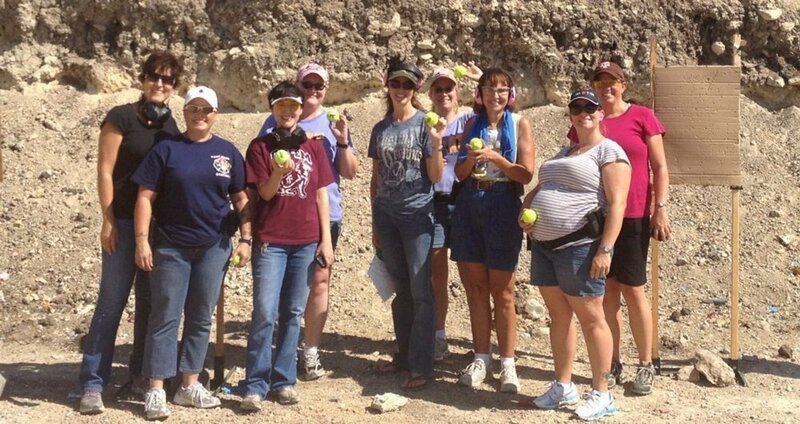 A Girl & A Gun prohibits our pregnant moms from participating in events at an indoor range. Indoor ranges, even state-of-the-art facilities with high-end air filtration systems and noise-reduction construction still pose a risk for lead poisoning and noise irritation. Indoor ranges are a no-go zone during pregnancy. Lead contaminants exist in the residue left on your clothes and body while shooting. Anytime you use a firearm or handle ammunition, you must clean your body/face and change your clothing before feeding your baby. A Girl & A Gun’s policy is that breastfeeding moms (and really All Moms or ANY PERSON that comes in contact with infants and young children) follow this important guideline. What about “pump and dump”? Studies indicate there is no benefit to pumping and dumping after drinking alcohol, but what about shooting guns? Melody Lauer has a wonderful article for nursing moms. She says: A quick note on lead exposure and breastmilk: What you ingest will make it into your milk supply. You will inhale or otherwise absorb lead particles throughout your time at a gun class. That lead has potential to make it into your milk. Try though I may I have found no reliable source of information to indicate that that exposure is enough to harm your baby through your milk. Even so, some mothers choose to pump and dump the milk they express during and immediately after gun classes. That is your choice. Personally, I have not had an issue giving the milk I have expressed during gun classes to my children and the lead tests they have had in their childhood have all come back normal. Another way to think about this is that whatever your blood level lead content is your baby can receive 5%. If you spend a significant amount of time on the range or work in an area that may be of concern, you can have your blood tested every 6 months and monitor your levels. Julie Golob has a wonderful guide that dives deeper into issues of lead and noise exposure during pregnancy. Good news, you get to slack off! That’s right — you don’t have to pick up brass, you don’t have to clean your guns, and really shouldn’t be loading your mags. If you have latex gloves you can at least handle ammo. Use firearms with suppressors to limit noise exposure. This is a dream for any shooter. A very expensive dream, but if you have access why not? Shoot lead-free ammunition. Brands like GECO use lead-free bullets AND primer. Only hunt with lead-free ammo so that you do not contaminate your meat. Use a face mask to limit inhaling lead dust. You may want to use gloves while shooting and always wash your hands and arms with a de-lead soap or wipes. Immediately wash all exposed skin with COLD and soapy water. Cold water keeps the pores of your skin closed and small, while hot water opens the pores and may encourage toxins to absorb into your skin rather than washing off. Shower as soon as possible. Clean your hair and body, head to toe. Remove range clothes as soon as possible and wash them separately. If possible, use a de-lead detergent designed to remove heavy metals. Keep in mind that if you get into your car and are wearing the same clothes you wore at the range, there is always a possibility for those toxins to leave a residue. Do not collect spent brass. Ask someone you trust to clean your firearm to avoid exposing yourself to lead, solvents, and other contaminants. Only eat and/or drink in areas where lead or lead-containing products are not being handled or processed AND after you have washed your hands and face thoroughly. Many competitors and law enforcement officers are unable to wait 10 months or longer without a decrease in muscle memory. If you choose to live-fire during your pregnancy, shoot in an outdoor, well-ventilated area. Ensure that you’re using lead-free ammo (with lead-free primer). Follow the tips listed, above. Be aware of risks of lead and noise exposure, and participate in moderation. If you want more safeguards, you have many dry-fire options. Dry-fire practice with a clean, decontaminated gun is a great way to continue to keep your skills sharp and work on trigger press, target acquisition, and more. 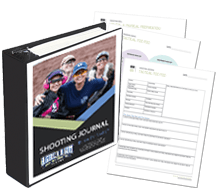 You can find a lot of drills in our Shooting Journal or you can buy dry-fire cards. Similarly, you can use a SIRT pistol, alone or in conjunction with target or laser-shot software. You can still stay ahead professionally or defensively, have fun with your friends and family, and keep your baby safe.